We’re smack in the middle of summer, and it’s right about this time that so many moms are pulling their hair out and ready to ship the kids back to school. They’ve maxed out their field trips and fun activities, and now it’s either ‘I’m bored’ all day long, or the kids glued to tablets, TV or video games. What about this? How about rallying the kids and getting them involved in something productive? As a former teacher, I’ve seen what amazing things kids can come up with when you give them a project, a purpose and cut them loose. I used to teach a missions class, and I gave them this project: Who needs help and what is the most extravagant way you can help them? They had all the freedom in the world (almost), and they came up with so many fantastic ideas – like babysitting for a single mom and throwing a baby shower for an unwed teenager. Two girls even came up with the idea to throw a benefit concert for a suicide prevention ministry they really cared about. They contacted a music artist, arranged the venue, invited other youth groups- and they did an AMAZING job raising over $3000! So, I’m a big believer in giving kids a mission, a goal – and getting out of their way to see what they come up with. During the summer, we’re all thinking, “How can I keep my kids busy? How can I keep my kids happy?” But what if we turned the tables and asked what could our kids do to make others happy? To serve someone else? There are so many creative ways your kids can give back, and I’ve seen what amazing results can come of kids putting their heads together and working on a project. Almost 100% of the time, they rise to the expectations you set. 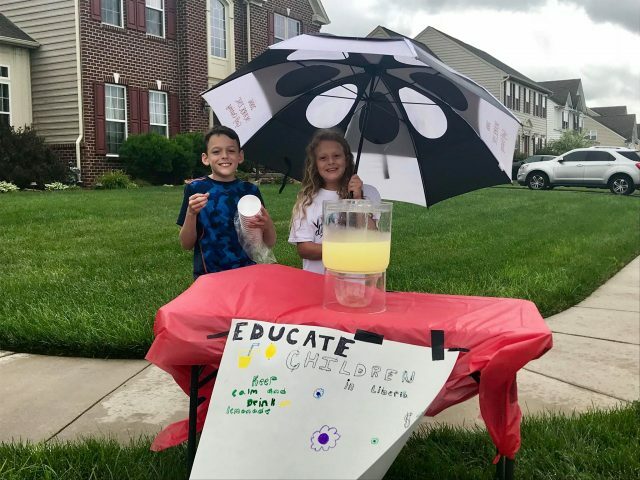 While on Facebook, my friend Tracy posted this picture of her kids running a rainy day lemonade stand. Their sign caught my attention, and I messaged her, asking what all this was about. She told me that her church, LifeHouse Church in Delaware, was doing fundraising projects all week long during VBS, and this is how her kids were contributing. First, I loved that her kids were out in the rain doing this. Shows so much commitment and heart. Second, my friend told me they raised $35 in ONE HOUR, with a total of $40 from their sale That’s some pretty incredible lemonade! 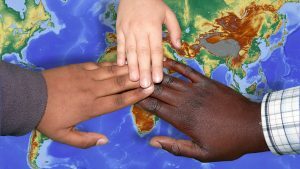 ” Kids were reminded that our lives should not be just about us, but that God commands us to think about and care for others in our GREAT BACKYARD (world). That when we make Him the center of our lives and we serve Him, we automatically serve others around us. “Kids took the love of Jesus into our neighborhoods and communities by making placemats to minister to friends in our community who visit Our Daily Bread right here in Middletown. “Additionally, they made Pillow Gifts/Bags for children who will attend Kay’s Kamp … a summer camp for kids battling cancer & those in remission. The leaders, Pastor Mark and Miss Tish, also volunteered to be slimed if they exceeded their $5,500 goal. Well…. I love this! What a fantastic thing for VBS to be more than just songs and activities but teaching kids at a young age to give back. That their hands-on crafts were used to bless and serve others. That a group of kids was able to raise over $6000 to help other kids in a foreign country go to school. What incredible love and character these kids are being taught. Your kids don’t need to be a part of VBS to do something significant. There are a ton of ways they can give back. 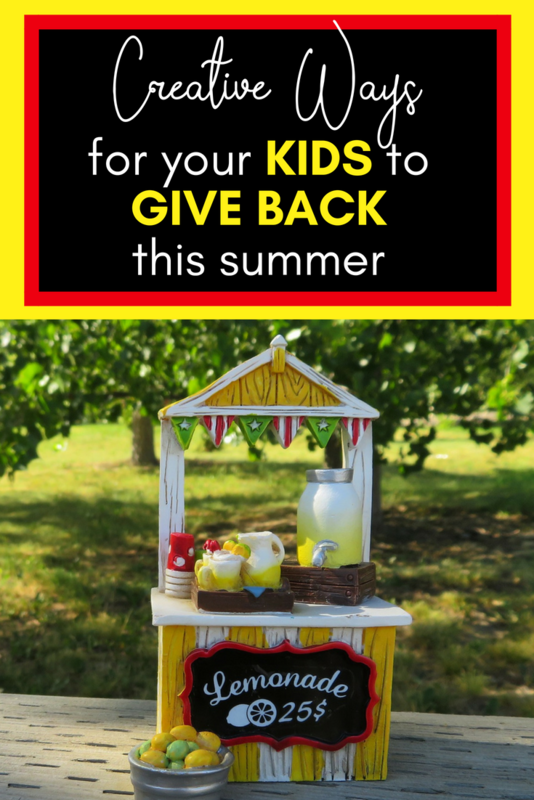 Here are some creative ways your kids can create a project to raise money and give back. Some are pretty simple – so simple that even the little ones can jump in. Some require a little more planning and work. There’s still plenty of summer left to pull this off, so take your pick! 1| Host an art show. Set up a location to display art projects and have a show where friends and families by the art pieces. The kids will have a blast creating projects and preparing the show. 2| Bake Sale: This is a tried and true project. Grab a bunch of kids to bake goodies and sell them in the neighbor, after church, or at the local grocery store. 3| Car Wash: Kids LOVE using water and getting wet. Why not make it for a good cause? Kids can even get sponsored per number of cars they wash.
4| Change Jars: Ask local businesses if they can set up changes jars for customers to donate loose change. 5| Fashion Show: Charge a small fee and have the neighborhood kids have a fashion show. They can even create some of their own clothing! 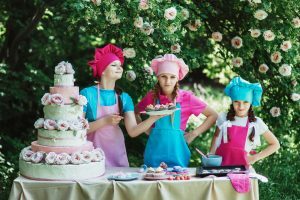 6| Cupcake Wars: Create a small entry fee and have kids bring their best cupcake creations. Have judges pick a winner; family and friends can purchase the cupcakes afterward. 7| Yard Sale: Kids have so many things they don’t need. Let them put together and run their own yard sale. This can include toys, books, clothes. You can even make things a little easier by creating an online yard sale on Facebook to help the kiddos out! 8| Jewelry/Key Chain Sale: Give kids some beads and lanyards and let them create jewelry and keychains. They can have a neighborhood jewelry sale. 9| Host an A-Thon: Walk-a-Thon, Bike-a-Thon, Dance-A-Thon, Bake-a-Thon. Make a big party and event of it and ask for people to sponsor them per (step, lap, mile, song, etc.). 10| Recycle Drive: In states where you can cash in bottle and cans for change, ask neighbors to donate recyclables for kids to cash in. If you are looking for some good causes for your kids to support, here are a few of my favorites. Lots of these help children, which can really connect with your own little ones. 3. VolunteerMatch.org: This helps you find volunteer projects that are suitable for kids, right in your own area and zip code! 4. Family-to-Family.org: This is great for your child personally helping another specific child in need! It really doesn’t matter what way your kids want to give back. If they are putting forth any effort, with any degree of enthusiasm, it will have been worth it for the people they’re helping and for your kids. If you aren’t sure which way to go, my best suggestion is to ask them what they’d like to do! Give them a few parameters and let their little brains run wild. I’m sure you’ll be amazed at what they come up with. After being a leader on many, many youth missions trips, when kids start serving at a young age, it becomes part of their make-up and stays with them long into adulthood. This is the perfect time to get started! Thoughts? Leave a comment. I’d love to hear them and chat! If you try a project here, please let me know! Post pictures and tag me on Instagram!